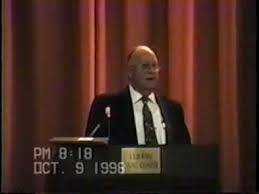 In 1998, Dr. Hoyt Chastain participated in a series of debates with a representative from the Church of Christ. This is the second speech he made in those debates. The subject is; Is Baptism necessary for Salvation. Dr. Hoyt Chastain was born May 20, 1914 he passed from this life September 26, 2007. He leaves behind a lifetime of service to the Lord Jesus. These lectures are part of his legacy for you to learn from a great soldier of the Lord.